La Urbana Bike was born in early 2014. 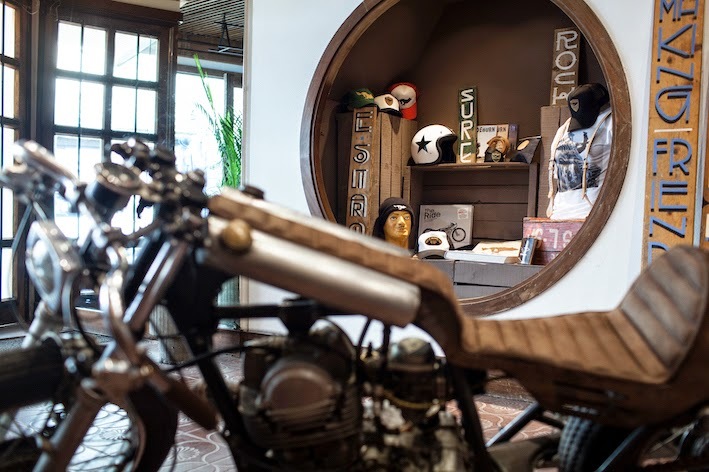 It all began with the idea of offering in one place motorcycle gear and apparel that was hard to find in our area, or even in Spain. As a motorcycle fan all my life, it also meant that my dream of working in the bike world would finally come true. My partner Beatriz and I opened then a small store in our house garage, and also started running the on-line store laurbanabike.com. The response from the customers and visitors was good enough to encourage us to move to a bigger, better located store. Sales at the store and on-line helped too! As a result, past 20th of March we opened the new La Urbana Bike, which you can see in the attached pictures. The launch party was a big success, with people coming from Asturias, Madrid and even Portugal. We offered Woll beer, cocktails by a pro-waiter and snacks and La Isla del Tesoro DJ played good music – mixed sometimes with sounds of some 60’s Isle of Man TT . We were lucky enough to have as special guest El Solitario MC family and some of their bikes, that will be shown at the store for some weeks. 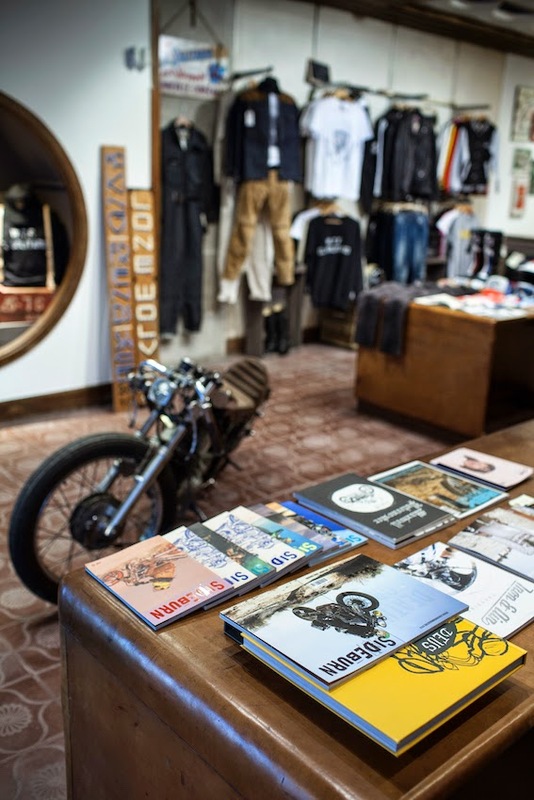 The idea of the new store is not only shopping, but also hosting events, offering a place to have a beer or coffee while reading Sideburn and other independent magazines or books, or just have a bike talk. 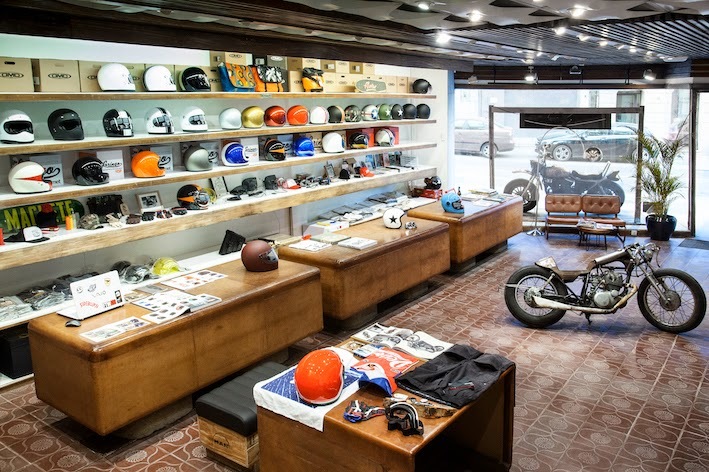 Our catalogue is growing all the time, and at this moment we are selling brands such as UglyBROS USA, Biltwell, DMD Helmet, Bell, FTWCO, El Solitario MC, Deus Ex Machina, Oury grips, Gasolina Boots, Norstar by AXO, Baruffaldi, Schoot NYC, Machete Company, Sideburn, Iron&Air, Moto Heroes, Rev, The Ride, El Diablo Magazine…and soon we will offer Icon 1000 and 100% goggles as well! 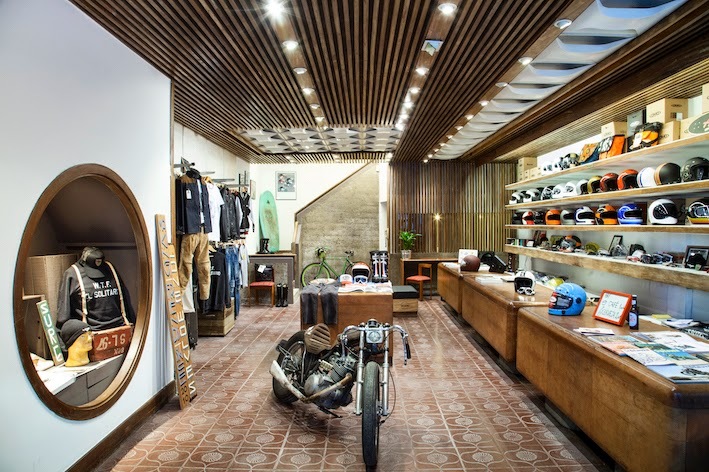 That's a great looking retail space.